The volleyball team starts out strong in conference play. Women’s soccer improved its record to 5-1 in conference play with an 8-0 drubbing of Rosemont College. According to the Marywood Pacers website, eight different Pacers found the back of the net with seven of the goals coming in the first half. Marywood’s offense proved dominant, outshooting Rosemont 31-7 with a 17-2 advantage in shots on goal. Junior midfielder Julie Youngman opened the scoring in the fourth minute. Sophomore midfielder Renae Moken starred for the Pacers by setting both herself and her teammates up. Following an unassisted goal, Moken assisted on three of the team’s goals. The number of Pacer goalkeepers featured in the match outweighed the shots on goal for Rosemont. Keepers Aly Moyer, Bella DiToma and Hayley Taylor only had to turn away a pair of Rosemont shots to preserve the clean sheet. In the first game of a tri-match, the Pacers defeated the Highlanders in straight sets by scores of 25-14, 25-7, 25-13. Sophomore outside-hitter Mikayla Attwood had 11 kills while sophomore middle-blocker Peri Sheerin had three aces for the Pacers in a convincing victory. Marywood’s second contest took a very different road to victory. 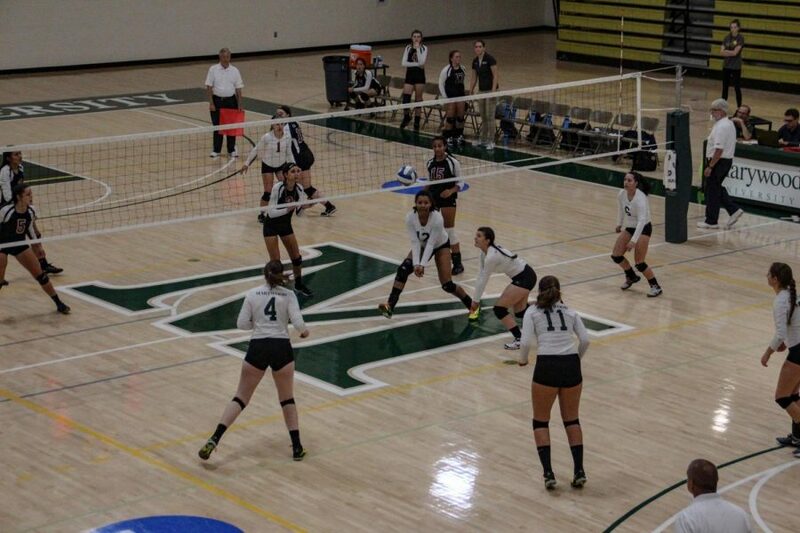 In a five set thriller, Marywood prevailed 25-18, 25-20, 15-25, 27-29, 15-12. After the Pacers claimed the first two sets, Keystone returned the favor to even the match at two sets apiece. Marywood rallied from a 7-3 deficit in the deciding fifth set to claim the match. Sophomore defensive specialist Jordan Vossler sets a school record for most digs. In the dramatic performance, sophomore defensive specialist Jordan Vossler recorded a record-breaking 43 digs. Sheerin posted 17 kills to go along with four aces and Attwood had 11 kills and six blocks. Notre Dame of Maryland University snapped Marywood’s two-game conference winning streak with a straight sets win, 25-21, 25-15, 25-20. The Gators’ Sarah Sweet led her team with 11 kills while teammate Jamie Reyes notched a game-high 27 assists. Notre Dame of Maryland improved its record to an dominant 17-3 with a 5-1 CSAC mark. Marywood quickly bounced back against Centenary in a lopsided affair, sweeping the Cyclones 25-8, 25-13, 25-14. 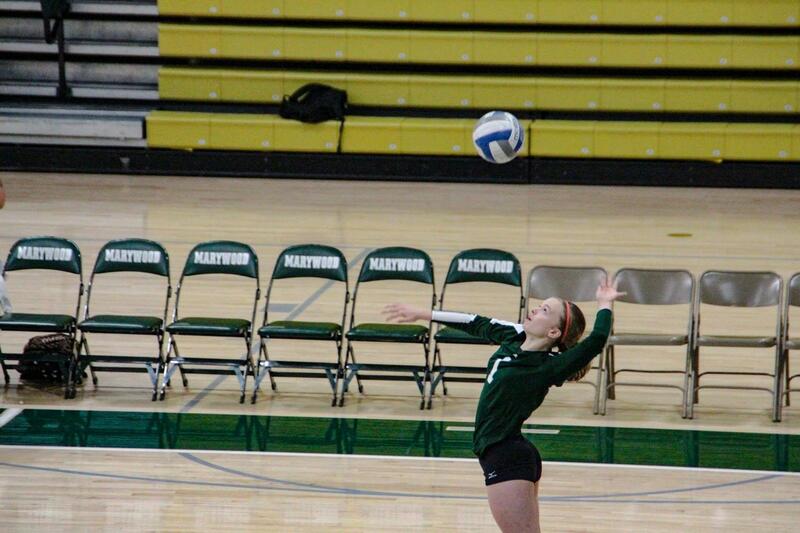 Marywood tallied 17 aces, 34 assists and 28 digs. Both Sheerin and freshman setter Annie Heyen led the way in all categories for the Pacers. The win improved Marywood’s CSAC record to 3-1. Men’s soccer rallied from a 0-2 deficit to capture an important conference victory. The Highlanders’ Joey Weaver scored a goal at the 47:56 mark to put Cairn up by a pair. Marywood answered just moments later when freshman midfielder Capers Borders drilled a shot from 30 years out to bring the Pacers back within one. Freshman midfielder Giovanni Amato tied the game just over 10 minutes later with a 40-yard strike. Amato then took advantage of a corner kick to set up a header from sophomore midfielder Carlos Perez in the 65th minute to put the Pacers ahead for good. 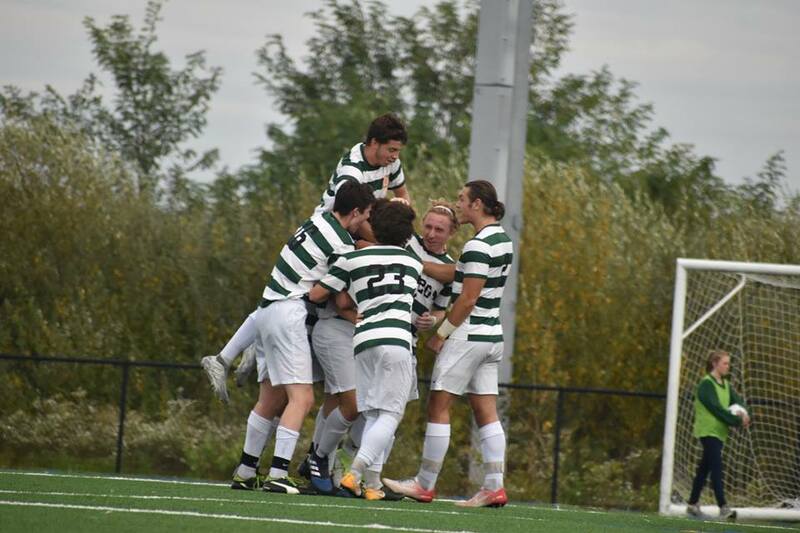 The men’s soccer team celebrates after scoring a goal against the Highlanders. The win evened Marywood’s mark at 2-2 in the conference while dropping the Highlanders below .500 to a 2-3 CSAC record. The rout was on when the field hockey team hosted Notre Dame of Maryland on Saturday. Marywood jumped out to a quick lead when sophomore forwards Lindsey Gladden and Lindsey Quinn scored back-to-back goals in the first two minutes of play. The Pacers continued to pressure the Gators as sophomore forward Karly Kaminsky scored off a rebound in the 13 minute. Freshman forward Angela Sanchez added to the lead with two goals before the end of the period. Marywood scored a total of 10 goals while outshooting the Gators by a staggering 50-2 margin. The win gives the Pacers a 2-1 conference record. After the Marywood field hockey team’s 10-goal performance on Saturday, Alvernia University shut out the Pacers’ offense. The lone goal of the game came when Alvernia’s Andrea Wysocki scored on a penalty stroke with no time left on the clock. Alvernia outshot the Pacers 15-6 and 9-2 on goal. Junior goalkeeper Kerri Mountz saved six shots in the loss.